Hypermetropia and Myopia , both are refractive defects in vision and are nearly opposite in nature. Below are the differences between the two . Myopia is also known as near-sightedness . Hypermetropia is also known as far-sightedness. In myopia , a person is not able to see distant objects clearly. In hypermetropia , a person is not able to clearly see the nearby objects. In this defect , lens are not able to produce sharp image of the distant objects on the retina instead the image is formed in front of the retina . In this defect , image is formed behind the retina. The reduction in the focal length of the eye lens may be a possible cause. The increase in focal length of the eye lens may be a cause. Another cause can be the elongation of eye ball. It may also be caused due to flattening of the eyeball . Myopia can be corrected by using concave lens of suitable focal length. 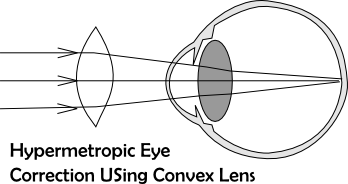 Hypermetropia may be corrected using convex lens of suitable focal length . This page was last modified on 28 April 2016, at 22:23. This page has been accessed 33,125 times.